I am so excited about my plant purchases of last weekend. 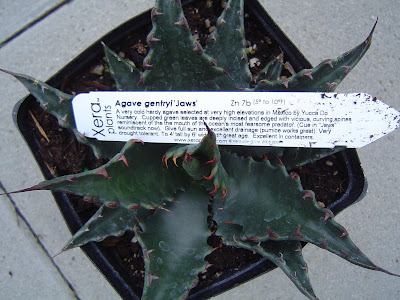 I seem to have been on a Xera plants kick as there were a disproportionate amount of their tags in my cart. Perhaps I am going to have to figure out how to get into their wholesale greenhouse in Tualatin…anyone out there with special privileges? 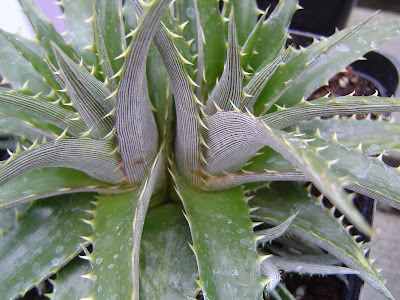 Pictured above is Dyckia platyphylla it’s borderline hardy here at best, but I will gladly protect it in the wintertime. 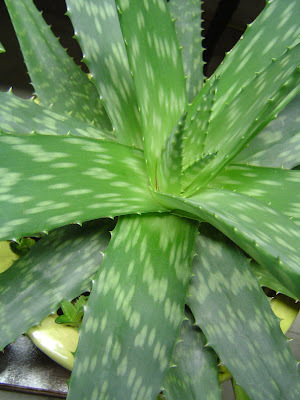 So symmetrical and those ridges on the underside of the leaves are beautiful! 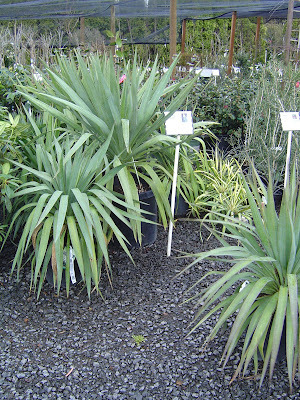 In order below are: Agave gentry 'Jaws' is another addition to my collection of cold hardy agave. Last year I purchased an Agave montana 'Baccarat' and it survived last winter, in the ground, only protected during the coldest of days. I hope the gentry ‘Jaws’ is up to the challenge. A purchase that was actually on my list (which is more surprising? That I have a list, that I manage to actually purchase plants on the list, or that most of what I bought wasn’t on the list?) 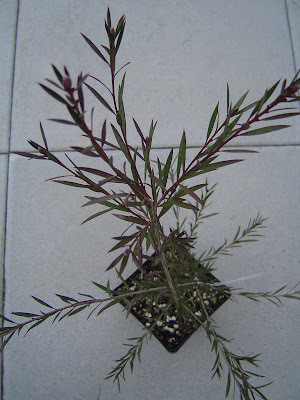 callistemon 'Woodlander's Hardy Red' – I am SO excited about this plant. It’s the hardiest of the red flowered bottlebrush and being evergreen looks great during all seasons. 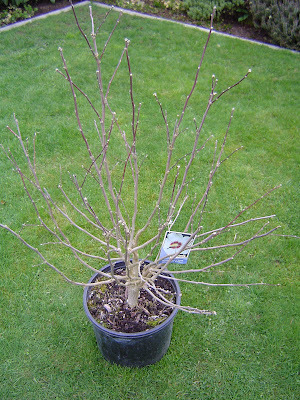 Also on the list was Hibiscus syriacus Rose of Sharon – red heart, this one will be put in the place of a couple of cordy’s that collapsed over the winter. 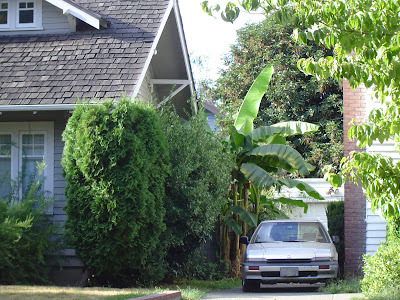 It was a sentimental choice, as the first house we lived in after moving to P-town had one growing next to the drive. Yes, there is even room for sentimentality in the danger garden. So those are the highlights – I also picked up a few white Lupines (seems I never find the white ones), lavender, Nicotiana sylvestris, and another horsetail rush. 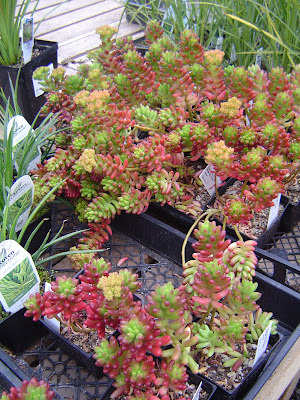 Next big shopping adventure (mark your calendars if you live in Portland) will be the Hardy Plant Society of Oregon sale the weekend of April 11 & 12…. 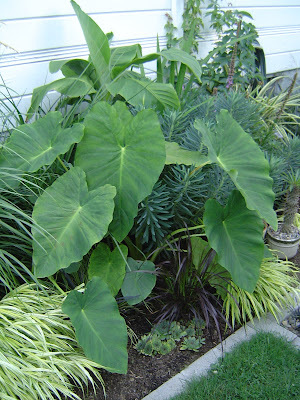 Jean Schwartz, my friend Andrea’s mother, sent this picture of her fav monster plant, a Cardiocrinum giganteum. Don’t you just love that name? 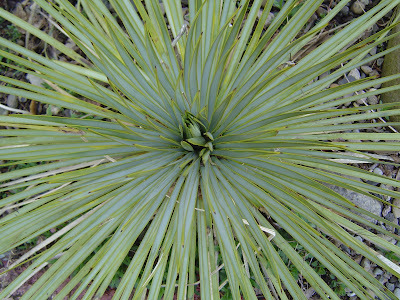 The tame plant pictured gives no clues as to what is to come. 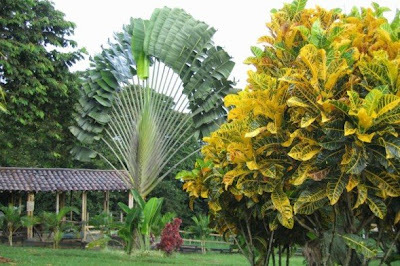 It belongs to the Lilly family, Jean says that it grows to 6’ to 8’ or taller and has white trumpet shaped flowers in the summer. Yikes, nothing like adding a little impact to the flower garden! 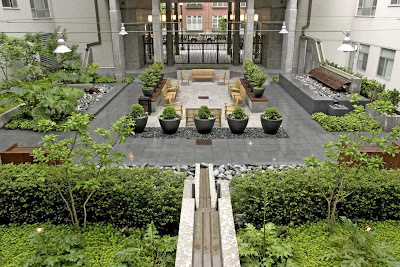 Jean is ½ of Schwartz Landscape Architecture, the firm behind the much talked about landscaping at the Inn at Northrup Station in NW Portland. 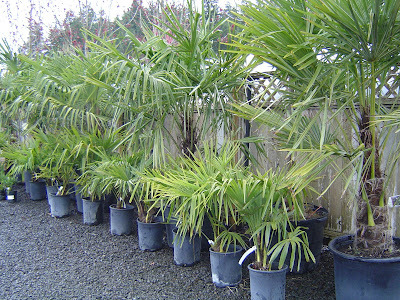 Love those palms! 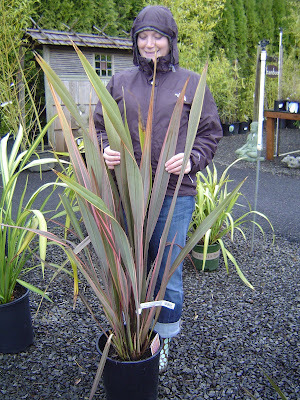 Like many of us my friend Denise suffered the loss of a favored plant last winter, her cordyline, Grover. You know you are in-deep when you actually name a plant. Oh come on, surely you have named a plant? Doesn’t everyone? Someday soon I’ll introduce you to Sammy and Clifford. Denise decided to replace the deceased Grover with horsetail rush. 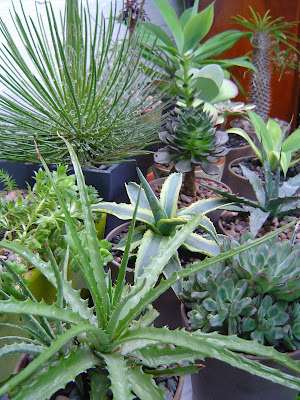 I have a couple in small pots on my patio and they are fabulous plants. Very “modern” and stylish, just like we were living in LA, in an Eichler. They also have a horrible reputation as being invasive thugs. Thus trying to find horsetail rush at most nurseries here in P-town elicits looks of surprise, why you would want to purchase a blacklisted plant? The good people at Hughes Water Gardens feel differently! So this Saturday we set out to visit. 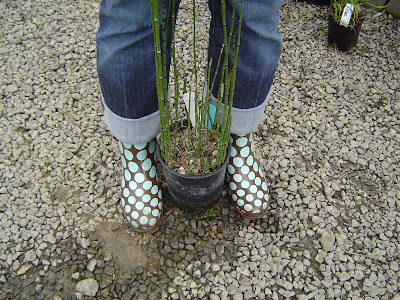 Never having been to Hughes Water Gardens it was an opportunity to visit a new nursery and, since we were already dressed for the rainy weather and had the plant hauling rig at the ready, why stop at just one? Farmington Gardens was our second nursery stop of the day. 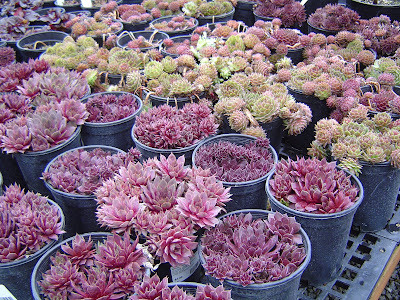 Hughes was not quite ramped up for the season; but I have to respect a nursery that does not rush things. The visit was a success, both of us left with several plants, horsetail rush included, and I will definitely be back later. Farmington Gardens was also a successful stop. It is too bad this nursery is in the middle of nowhere (everything is relative – nowhere in relation to my world, it would take about an hour to get there from Chez Bohl). They have great plants, I wish I could visit them more often. Photos below are in order of the day the first 4 being Hughes and the last 5 Farmington. 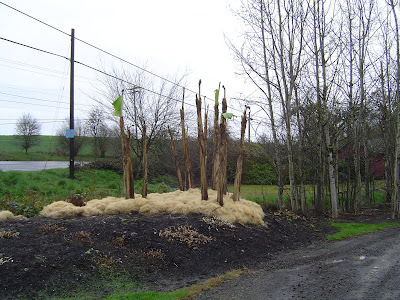 Since I am always on the lookout for good ways to protect my borderline hardy plants I loved seeing how the folks at Hughes protected their amazing bananas, I can’t wait to see them in July! 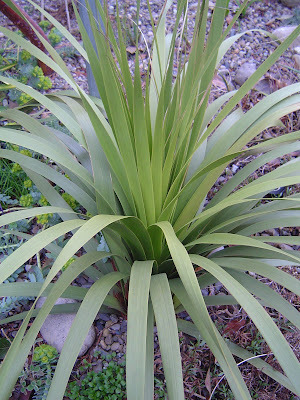 Oh – and Denise became a flax covert along the way, she just had to have the fine specimen shown below. I’ll post later about my fabulous plant purchases. Can you stand another picture of a hellebore? 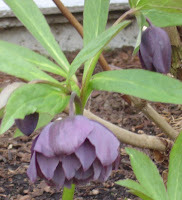 Actually this post is as much about the absence of spring flowering bulbs as it is about hellebores. I love seeing daffodils, tulips and hyacinth in other people’s gardens, or in a vase, but they are just too darn sweet for the danger garden. And (truth be told) I can’t abide by the “leave the foliage until it dies back naturally” rule. I know the poor little bulb needs the foliage to nourish next year’s growth, but it just looks so ugly! I can leave it alone for a week, maybe even two if I am distracted, but then I end up cutting it off. Each year the flower gets smaller until they cease to even bloom. So, no more! Hellebores are my spring bloomer of choice. 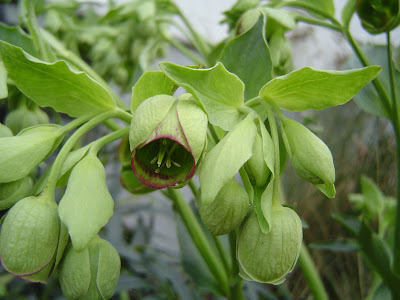 The tag that came with the green flowered Helleborus foetidus ‘Wester Flisk' labeled it as a “bear claw” hellebore (In reference to the shape of its leaves I believe – which I foolishly did not photograph). Ah yes…this is meant to be, bear claws are very dangerous! Am I the only person who really enjoys mowing the lawn? Always have, even when I had a lawn 10 times the size of my current lawn. 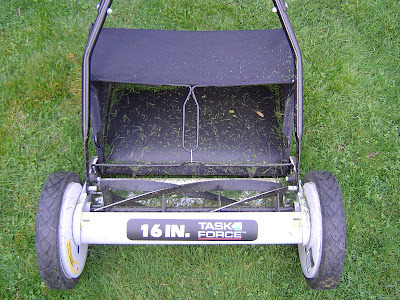 Maybe the secret is that I have always used a reel mower (or should that be real?) you know, the old fashioned kind. You get to slow down, smell and hear what you are doing, and get a little exercise. You can even hear the birds while you are mowing! I love it. Tonight was my first mow of the season and my first mow since we adopted Lila, our pug. Since she has a fatal attraction to everything that might potentially maim or kill her, she stayed inside until the mower went away. Once I broke out the edger she came out to play. 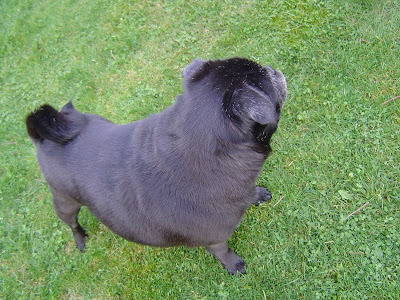 I think she may be in a pug witness-protection-program as every time I turned the camera on her, she would look away. I wish I could show her rolling in the grass in joy, or crouching like a tiger ready to pounce - but I was having too much fun with her at those times to go get the camera. As you may guess, when I travel taking pictures of the plants is a priority. On my first visit to the Phoenix Art Museum I was in awe of the landscaped courtyard. 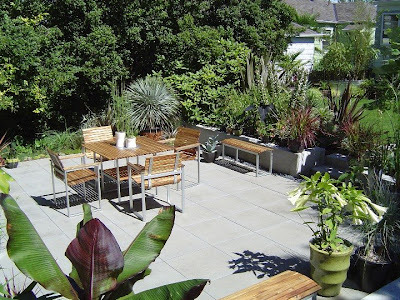 The space was so clean and simple with straight lines, interesting textures and the plants were just perfect. The bright Phoenix light, so different from what we get in Portland, really alters the way your eye takes in the colors. The Phoenix Art Museum opened in 1959 and unveiled an expansion by Tod Williams/Billie Tsien & Associates of New York (the same architects that originally designed the building) in 2006. Visit it! The collections, traveling exhibits, building, and landscaping are all super. And, much to my husband’s surprise the restaurant is really quite good too, unlike many museum restaurants. 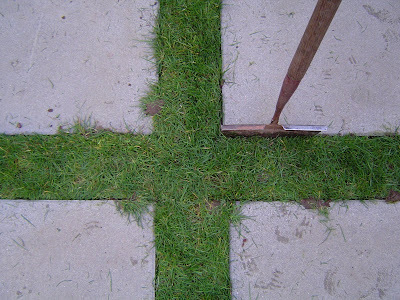 Do beer and danger gardening mix? They do at McMenimans! 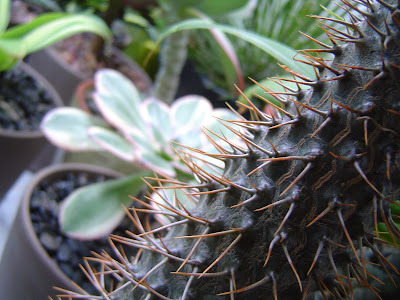 There is a little danger garden out back at the Kennedy School where the spiky, prickly plants rule. 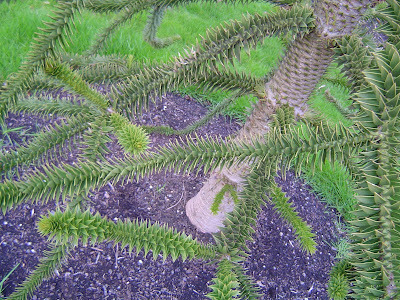 On the street front there are two fine specimens of the Monkey Puzzle tree. Usually these trees are either super tall, or in a private yard where you can’t walk right up to them and enjoy an up-close look. Here you can, but be careful - the leaves are razor sharp scales! One of the stories I've read about their common name is it came from the fact that a monkey couldn't possibly puzzle out how to climb up to get at the edible seeds. 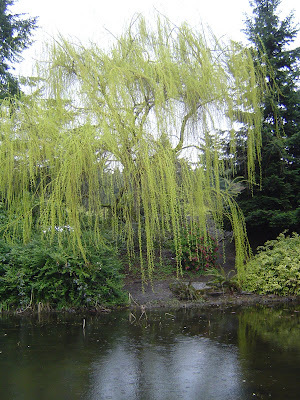 You see a lot of these trees around town because seedlings and small plants were handed out at the Chilean exhibit at the Lewis and Clark Expo in Portland in 1905. Since we live close to the Kennedy School walking over for dinner, and sometimes a movie, an easy night out. The grounds are so fabulously landscaped that, for me, a visit is almost as much about the plants as it is dinner and a beverage (Black Rabbit Red for me –Terminator Stout for the husband). The McMenimans are long time clients of Ankrom Moisan, the firm I work for, so visiting their properties is kind of like a work-related field trip (a very fun one). This time of year it’s amazing to watch the transformation as the plants emerge and the grounds become lush once again. 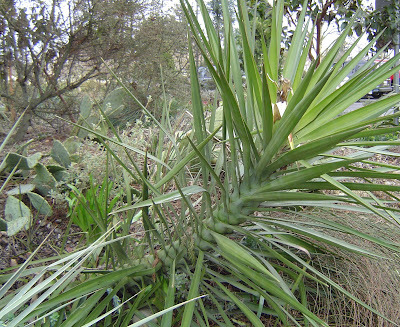 Another favorite plant of mine and one I am wondering about its chances for return this year. 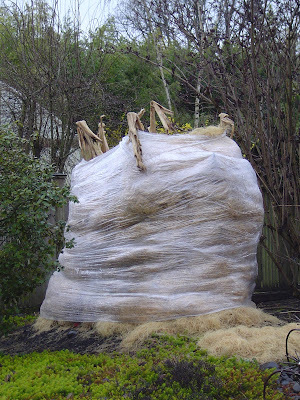 It should be hardy, but since I can't imagine the garden with out it, and it's cheaper to buy the bulbs now rather than plants later, I picked up a bag of 5 last weekend. If these return, then I'll just have to find another spot in the danger garden for 5 new plants! Darn. 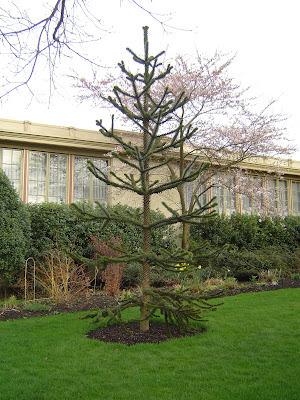 While this is rumored to be the hardiest of all bananas, and defiantly root hardy to much colder temperatures than we experienced, the pseudo-stem (trunk) is tender and likely to die back to the ground if not protected from temperatures below freezing. I was hoping to preserve the pseudo-stems and begin this year’s growth from there, having to start back at ground level would have been disappointing. After pealing off layers of decaying leaves and burlap (along with a couple very happy slugs) I was pleasantly surprised. 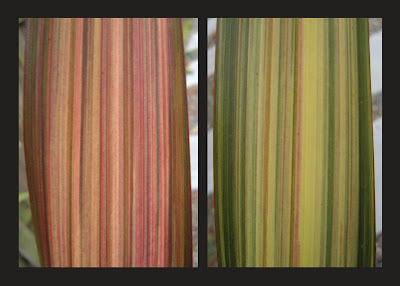 The 2 main pseudo-stems were solid and in fact the 4ft one was pushing out a new leaf! Ah – this was exactly what I needed! After a sad morning of cutting down our three 6ft tall cordys (dead) and chopping the crispy brown leaves off my beloved Phormiums (might be, but might as well be, dead) a little life in the danger garden is a welcome sight. ...a day I thought would never arrive. In honor of this exciting day I share with you a photo my brother took in Colombia - he and my sis-in-law were there visiting her family. Look at those plants! Everybody loves a before and after story, right? Our Backyard Patio Project. That's a little teaser "after" photo on the left, other photos are at the end of the post, in chronological order. 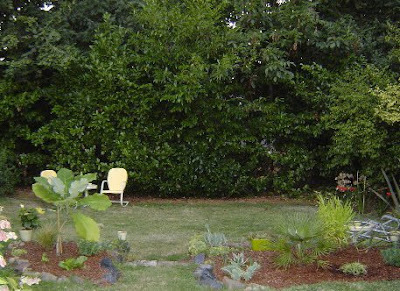 We bought our house in June of 2005; the back of the property was enclosed by a lush green wall of laurel. The dead grass, dandelions and roses had to go, but we loved the wall of green and it figured large in our future plans. 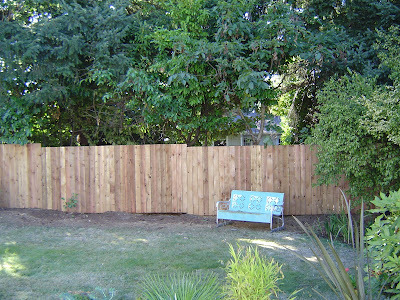 Unfortunately that first fall our neighbor cut down a great deal of the laurel and built a rather uninspired fence. We thought the laurel was on our side of the property line, but we were wrong. Lesson 1: never assume that a chicken-wire fence marks your property line. 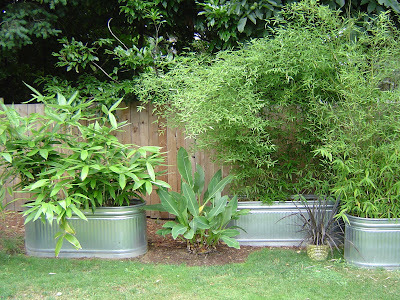 Come spring, to block the new view, we purchased three large “architectural planters” and filled them with bamboo. Ok - some of you know these as stock tanks, some city folk refer to them as “architectural planters”, that way they can charge twice as much for them. We bought ours at the Burns Feed Store, (nice people and if you are there at the right time of year you can see baby bunnies, pigs or chicks). 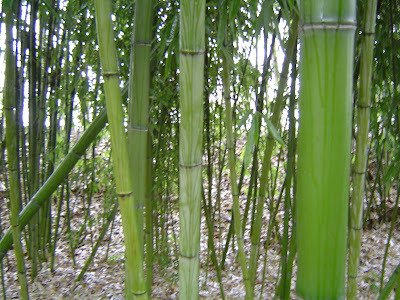 Thank goodness the bamboo grew fast, hid the fence and the neighbor. 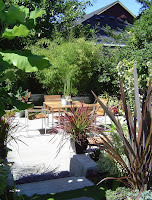 We had to make-do with this bamboo screen for the summer of ‘06 while we concentrated on the front yard (yep – that’s another post). 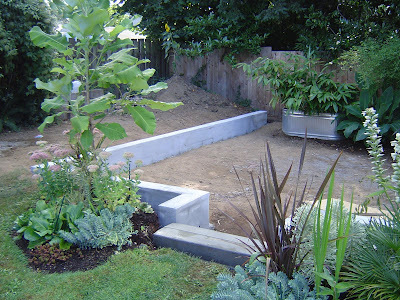 Late summer ‘07 we returned to project mode in the backyard: we tore up the grass and dandelions ourselves, hired someone to replace the crumbling concrete wall, and extended it to an “L” shape to enclose a “sunken” patio. 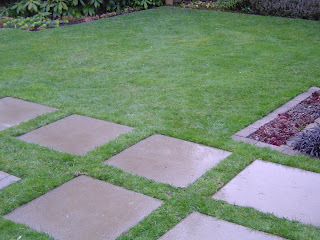 The patio is made up of 24” sq slabs which we installed ourselves over several weekends. Thanks to my husband Andrew’s ingenuity, hard work and strong back it looks every bit like a professional job. 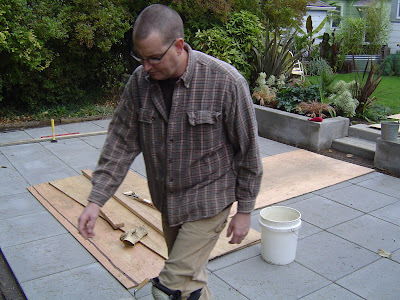 We finished on Thanksgiving weekend, the same time the rains returned to Portland and we retreated inside to hibernate for the winter. After several plant shopping and planting adventures the spring of ‘08 the patio project was finally complete. And just in time as that summer we logged a record number of visitors and Chez Bohl was booked every weekend from the end of June though mid-August. We were able to spend the summer relaxing with family and friends and enjoying our new patio. Next project, started the fall of ’08 and still in progress, our “shade shack” (thanks Dad for the catchy name) to the south of the patio. More on that in future posts! This book has been on my wishlist for months, and while at Powell's last weekend I finally bought it. So far it’s a very interesting read; I recommend it… if you’re the type that would enjoy reading about an eccentric lily breeder, or a second generation violet farmer. I’ve also learned that somewhere along the line “scent” became less and less important and has been virtually lost (bred out) from most cut flowers in favor of a long shelf life and other industry considerations. Some florists actually spray perfume on the flowers to make them smell like flowers! Huh? Next up from the same author: Wicked Plants: A Book of Botanical Atrocities. Perfect for the Danger Garden! 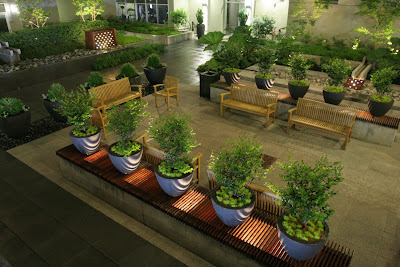 Working at Ankrom Moisan (AMAA) I get to enjoy the great landscape architecture done for our projects. One of my favorites is 10th @ Hoyt in the Pearl District in Portland. The internal courtyard is actually a green roof, the parking garage is beneath. 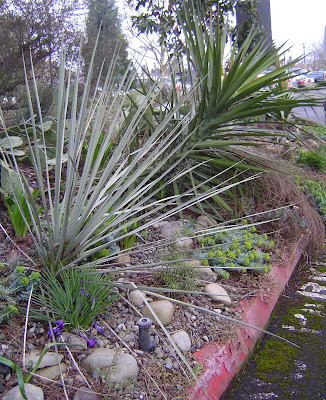 When rainwater falls (which is often in Oregon) it is captured and re-circulated through water channels, sculptural metal boxes and planters. 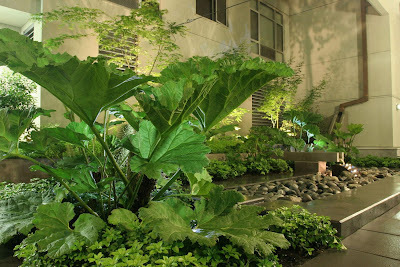 The plantings are lush (love that Gunnera) and the lights strung across the space give it an Italian piazza feel. 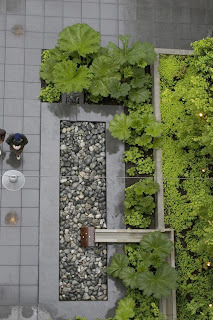 Koch Landscape Architects is the firm behind this fabulous space and my fellow AMAA'ite Kirsten Force is the photographer. Is it open to the public off 10th Ave – check it out the next time you're in Portland.